SHSMD Connections 2016 was held in Chicago from September 11-14. As we introduced in our previous post, the Society of Healthcare Strategy & Market Development (SHSMD) Connections is a tremendous opportunity to network with an estimated 1,400+ healthcare marketing, public relations and communications, and strategic planning professionals while taking in more than four hours of keynote sessions and choosing from 60 sessions and eight targeted learning tracks. This year, five members of the Stratasan team attended as a Gold Partner and tote bag sponsor. As expected, we found our SHSMD experience to be a rewarding mix of networking with peers in our field and learning best practices from specialists in every area of the healthcare industry. Ann Compton stole the show. What a treat! 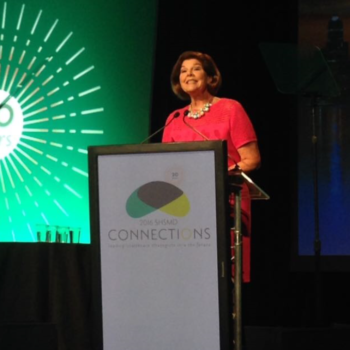 SHSMD Connections 2016 kicked its 20th year off with a keynote by journalist Ann Compton. The keynote commemorated the 15th anniversary of September 11th and Compton brought the perfect perspective to help us honor those we’ve lost and celebrate the spirit that permeates our great country. Compton, as only she can, retold her firsthand experience of being the “pool reporter” covering President Bush on that solemn day; regaling the moment the President was informed, to being the “only plane in the sky” on Air Force One, and finishing with a personal story of a young man who lost his life. Through this riveting and tear-filled journey, Compton perfectly illustrated the immense importance media plays in reassuring the public that our nation is safe, especially during the fog of war. For members of SHSMD, it brought to bear, albeit in a much less significant manner, the important role we serve for our organizations and partners in times of uncertainty and crisis. Healthcare is a fundamental right, and it is our job as planners, marketers, physician relationship managers and public relations artists to ensure we are communicating to and meeting the needs of our neighbors, friends, and loved ones. Honorable Mention goes to Alison who opened the conference with the Star Spangled Banner. Wow—what a Star Spangled Banner! I didn’t catch Alison’s last name but wow… she has some pipes! To hear her performance on the 15th anniversary of September 11th was an honor. Strategic Growth dominated the conference. Alignment, alignment, alignment! There were eight tracks at SHSMD this year: Marketing, Public Relations & Communications, Digital Engagement, Strategic Planning & Business Development, Physicians Strategies, Analytics & Research, Customer Experience, and Leadership Development. The common theme was that each of these eight tracks do not live in silos, but rather, are interdependent and together they can achieve Strategic Growth. In one session, I learned how a health system was using its own patient data, matched against market share data, matched against utilization projections to inform the decision-making process on where to place a new entry point. That data was then combined with competitor location data, demographics, psychographics, available real estate, drive times, and traffic volume. Finally, payor mix and contribution margin were layered on top to ultimately score locations in terms of desirability and effectiveness for reaching strategic growth goals. Once selected, digital and marketing teams would be informed on which potential patients to target and which to omit to prevent cannibalization, business development teams would be informed on which physicians to target for education on cost, quality, and convenience and finally, PR teams would be educated on which media outlets were most important. All of this in one strategy session! This session touched on all things SHSMD and represented the convergence of the eight aforementioned tracks. And, like all sessions, this one was packed with people eager to learn! Data is always useful, but can be interesting too! 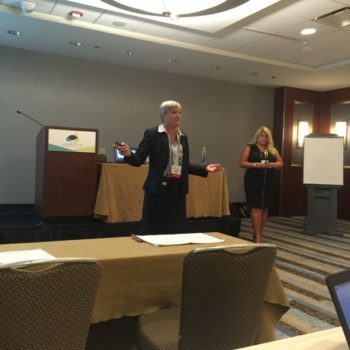 I had the pleasure of attending a conference pre-workshop led by my colleague Lee Ann Lambdin along with Mitzi Kent and Dustie Maguire of LifePoint Health. Together, these three healthcare experts discussed the use of readily available data to help physician relations teams focus on the right opportunities in their markets. LifePoint Health provided case studies of their utilization of Stratasan’s Physician Pathway platform to show how it is improving physician outreach to increase value, quality, and convenience for their patients. 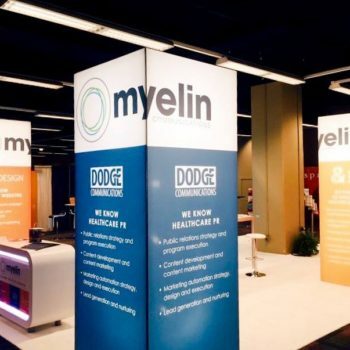 Myelin Communications had the best booth. For us exhibitors, there is always a little bit of gamesmanship in booth placement, attractions, and design. For each of those three, I proclaim Myelin Communications as having the best booth. They nailed location (right in front of ours ;-) ), booth design (see photo), and to top it off, they had margaritas and promised bloody marys for next year’s morning session. Second place goes to Marketware for having two locations (we noticed) and third, to Pandora Radio for having to endure being our other neighbor. Seriously, though, I want to personally thank all of the attendees who toured the exhibit floor. Exhibiting at a conference is one of the hardest things a vendor will do and your smiles and pleasant conversations make it worth it. (At least that’s what I’m telling my feet). We are all here for you, looking for ways to deliver value to you and your organizations. PS—I still have some free hugs to give away… watch out, regional conferences. Chicago was a great host… your move, Orlando. Chicago was a great location for the conference: centrally located, easy to get to, and chock full of activities. Chicago is the home to the American Hospital Association and our sub-association, SHSMD. I must add that Diane Weber, Emily McCracken Lee, Ann Marie Bell, Linda Griffin, and the entire SHSMD team deserve credit for executing flawlessly on this event. You make being a Gold Sponsor well worth it and we are forever thankful to you. It’s time to give Orlando notice: SHSMD Connections 2017 is coming September 24-27th and you’d better be ready as the changemakers in healthcare descend upon Disney. Article by Drake Jarman, VP of Sales for Stratasan. Drake joined Stratasan in 2014 as the VP of Sales. He is responsible for leading the sales team and has extensive experience selling into healthcare systems, having previously served as the President of Wellness Environments. Prior to Wellness Environments, Drake was involved in national politics, serving as the National Finance Director for Governor Mike Huckabee’s Political Action Committee, HuckPAC, and working for then Senate Majority Leader Bill Frist’s VOLPAC. Drake holds a B.A. from Wake Forest University, is a graduate of Montgomery Bell Academy, and resides in Nashville with his wife, Christina and infant son, Mac. If you need help improving your data process or how to properly use your data to drive strategy, email us at sales@stratasan.com.